If you have suffered the loss and double trauma and anguish caused by a Solicitor negligently failing to achieve the right outcome in a clinical negligence claim following an injury caused by a negligent Doctor or other health professional, you will rightly feel badly let down and will no doubt have lost a lot of trust and faith in the professions and their ability to help you. 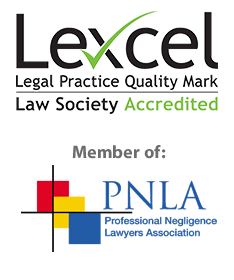 It is important to realise in these circumstances that not all professional people are the same and that if you had a good enough clinical negligence claim which was lost or damaged by a negligent Solicitor you should be able to recover the compensation you deserve, through a professional negligence claim against the Solicitor. The Medical Profession is not immune from making mistakes and these can have very significant physical and financial consequences for the unfortunate Client/patient. When someone has already had to find the strength and determination to fight for justice but has not recovered their rightful compensation as a result of the negligence of the Solicitor to whom they had entrusted their claim, the impact can be truly devastating. We are experienced in pursuing negligent solicitors in respect of failed medical negligence cases or claims for clinical negligence where the rightful compensation has not been obtained, due to the negligence of their Solicitor. It is important to use an experienced team when it comes to making any sort of claim against a Solicitor or other legal professional because these cases are often complex and difficult and the Solicitors and lawyers’ Insurers will use many legal arguments to challenge your claim. This is even more the case when the subject matter of the claim is a previous Clinical Negligence claim. Clinical Negligence claims are often complex themselves, with the Doctor’s Insurers doing their best to challenge the case against them. This gives the Solicitors’ Insurers even more opportunity to argue that not only was there no negligence, but even if there was, your case would not have succeeded or obtained the outcome which you say was lost by the Solicitor. We have specific experience of pursuing successful claims against Solicitors where the Solicitor has lost the Clinical Negligence case or damaged it as a result of their negligence. We can also draw on our experience of pursuing successful personal injury claims against Doctors and Hospitals.